Lions are one of the best wildlife field sketching subjects, as long as you can find them, because they are normally lazing around during the day and give you plenty of time to create a sketch. This lion was conveniently leaning against a grassy bank as he dozed, which gave me a great angle. Even when I can only see a small section of the belly and shoulders, I still sketch the entire belly and shoulders, overlapping the shapes, to make sure that the body is correctly proportioned. These feint pencil lines usually disappear when I add the watercolor, but if they are still visible, that fine too. After all, this is a field sketch! These field sketches were created during my Aug/Sept 2015 African trip. All my field sketches, are created in Africa directly from life, or sketched back at camp purely from my memory of sightings. They are completely finished in Africa and I use no photos or video reference at any time in their creation. It is always tempting to add finishing touches back in the studio, but I avoid this to ensure that my field sketches really are field sketches. This Original Field Sketch is watercolor and pencil on watercolor paper, 10×8″ and priced at US$180. Limited Edition Giclées are also available, priced at US$70 each. Only 10 copies are available, printed using archival inks on watercolor paper, 10×8″, all signed and numbered by me. Until Nov 22, I will be sharing 1 of my new African field sketches every day. The new sketches are shown to my newsletter readers a full day before they are shown here. Click here to Join my Mailing List and see the sketches as soon as they are released, or see them here 1 day later. Wherever and whenever you see them, I hope you enjoy them as much as I enjoyed creating them. Tomorrow’s sketch is of another sleeping predator – a lioness! 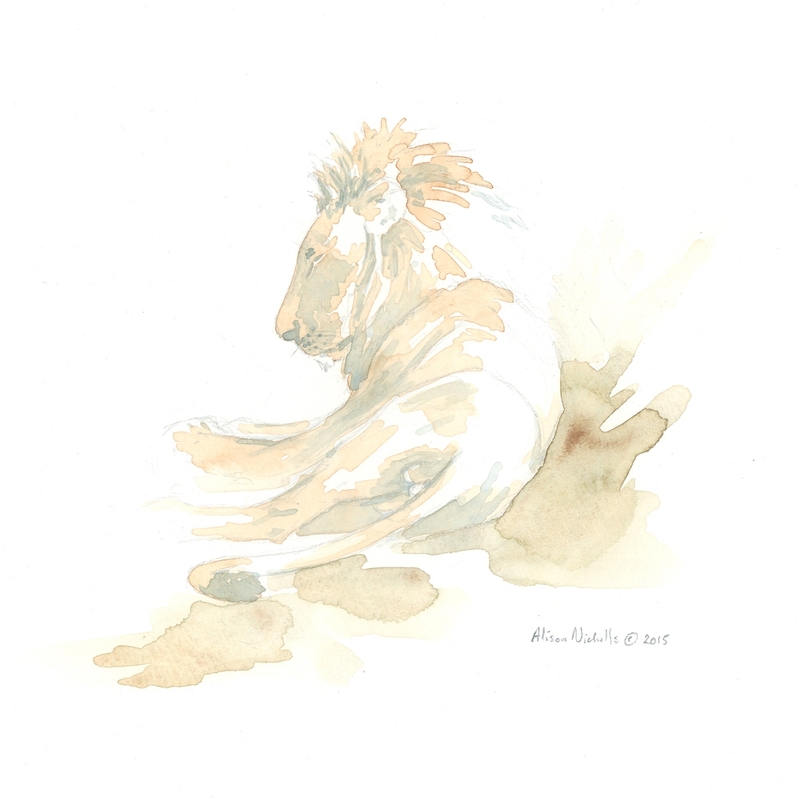 This entry was posted in African Wildlife, Big Cats, Blog Posts, Field Sketches, For Artists, Watercolors and tagged African lion art, African lion sketch, Alison Nicholls, Botswana lion painting, lion watercolor on November 9, 2015 by Alison.